When the climate control system is deactivated, the outside air supply and circulation are also deactivated. Only choose this setting for a short time. Otherwise the windows could fog up, impairing visibility and endangering you and others. Switch on climate control primarily using the button. - Turn the SmartKey to position 2 in the ignition lock. - To switch on: press the button. lights up. Airflow and air distribution are set to automatic mode. goes out. The previously selected settings come into effect again. The cooling with air dehumidification function uses refrigerant R134a. This coolant does not contain chlorofluorocarbons, and therefore does not damage the ozone layer. button goes out. The cooling with air dehumidification function has a delayed switch-off feature. indicator lamp in the button flashes three times or remains off. You can no longer switch on the cooling with air dehumidification function. - Consult a qualified specialist workshop. - Set the desired temperature. - To activate: press the button. Automatic climate control: when automatic mode is activated, you can select a climate mode setting. This function is only available with automatic climate control. The climate control settings are especially effective at high temperatures. the desired climate mode appears in the display. Different temperatures can be set for the driver's and front-passenger sides. - To increase/reduce: turn controls 1 and 6 clockwise or counterclockwise. Only change the temperature setting in small increments. Start at 72 °F (22 °C ). You can select different temperature settings for the driver's and front-passenger sides as well as for the rear compartment. - To increase/reduce the temperature in the front: turn controls 1 and 6 clockwise or counterclockwise. Only change the temperature setting in small increments. Start at 72 °F (22 °C). - To increase/reduce the temperature in the rear compartment using the front control panel: press the button. - Turn control 1 clockwise or counterclockwise. The temperature setting for the driver's side is adopted for the rear compartment and the front-passenger side. - To increase/decrease the rear compartment temperature using the rear control panel: turn control 17 on the rear control panel clockwise or counterclockwise. rear center and rear side air vents. button repeatedly until the desired symbol appears in the display. - To increase: press the button. - To reduce: press the button. You can use automatic climate control to set the airflow in the rear compartment separately. Dual-zone automatic climate control: the temperature setting for the driver's side is not adopted for the front-passenger side. 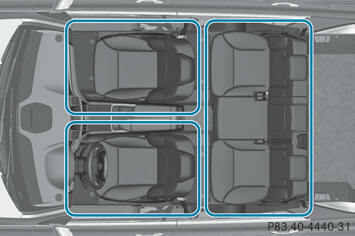 The temperature of the front-passenger side is adopted for the rear compartment. Automatic climate control: the temperature setting for the driver's side is not adopted for the front-passenger side and the rear compartment. When the buttons or controls for temperature, airflow or air distribution are activated, the temperature setting for the driver's side is not adopted for the other climate control zones. The temperature setting for the driver's side is adopted for the front-passenger side and the rear compartment. You can use this function to defrost the windshield or to defrost the inside of the windshield and the side windows. You should only select the defrosting function until the windshield is clear again. goes out. The previously selected settings come into effect again. The cooling with air dehumidification function remains on. Airrecirculation mode remains deactivated. goes out. Airflow and air distribution are set to automatic mode. - Turn controls 1 or 6 clockwise or counter-clockwise. The MAX COOL function is only available in vehicles for the USA. MAX COOL is only operational when the engine is running. The indicator lamp goes out. The previously selected settings come into effect again. - Activate automatic mode . - If the windows continue to fog up, activate the defrosting function. You should only select this setting until the windshield is clear again. - Activate the windshield wipers. The rear window defroster has a high current draw. You should therefore switch it off as soon as the window is clear as it only switches off automatically after several minutes. The rear window defroster has deactivated itself prematurely or cannot be activated. - Switch off any consumers that are not required, e.g. reading lamps or interior lighting. In the event of high pollution levels or at high outside temperatures, airrecirculation mode is automatically activated. When air-recirculation mode is activated automatically, the indicator lamp in the button is not lit. The residual heat function is only available in Canada It is possible to make use of the residual heat of the engine to continue heating the stationary vehicle for up to 30 minutes after the engine has been switched off. The heating time depends on the temperature that has been set. The blower will run at a low speed regardless of the airflow setting. If you activate the residual heat function at high temperatures, only the ventilation will be activated. The blower runs at medium speed. - Turn the SmartKey to position 0 in the ignition lock or remove it.